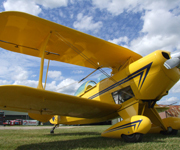 This means that together they can provide an exciting addition to your airshow or private party. Stephen has designed a series of sequences ranging from high-eneryy aerobatic displays throught to slower, photogenic and graceful displays. You can discuss and choose what type of display best suits your needs. Call now to discuss your ideas for an aerial display on 07884 236873. For more technical detail and or no obligation discussion about your needs, call me now on (07884) 236873.